Looking for an excuse to extend your stay? No matter what the season, we’ve got you covered! From Sharpsburg to Shepherdstown, Boonsboro to Hagerstown, there are plenty of things to do, featuring everything from theater arts to festivals to the awe-inspiring luminaries at Antietam. This Top 10 list of “Must-See” events is a great starting point for planning your ‘Bucket List’ of activities during your stay at the Jacob Rohrbach Inn. The Washington County Playhouse is a wonderful gem in downtown Hagerstown offering intimate dinner theater featuring various plays & musicals, plus shows for children. The productions are vibrant and well produced and the actors are also your waitstaff. Dinner includes a full buffet and salad bar and the drinks are fun and have theater themes. A little piece of Broadway, right here in Hagerstown! Definitely a MUST-SEE! Held every April at Fort Frederick State Park, Big Pool MD. Come to historic Fort Frederick, an original stone fort built in 1756 during the French and Indian War, and travel back in time to an authentic 18th century market fair. A whiff of campfires fills the air and colorful entertainers are found strolling about the fair. Visit sutlers (period vendors) selling 18th century wares: pottery, tin and copper ware, clothing, material and patterns, books, fireplace and cooking hardware, muskets and accoutrements, paintings and prints, lanterns and other camp gear, etc. See hundreds of fair-goers of all ages dressed in colonial clothing: artisans, soldiers, ladies & gentlemen, Native Americans, longhunters, traders, servants, etc. With free entertainment for all this fair is a MUST-SEE! Held the first weekend after Memorial Day in Hagerstown, MD. The Western Maryland Blues Fest serves up an annual community celebration centered around one of America’s most enduring musical forms – “The Blues.” Set amidst raw-boned guitar riffs and emotionally charged vocals, Blues Fest represents a unique partnership between City government, event volunteers and local business sponsors as they team together to present four incredible days of musical entertainment and family fun. A very musical MUST-SEE! Held the first Saturday of July near Sharpsburg, MD. Since 1986 the Maryland Symphony Orchestra has presented a free “Salute to Independence” Concert at Antietam National Battlefield near Sharpsburg, MD. The evening concert attracts nearly 30,000 people from all over and is capped off by a spectacular fireworks display, one of the largest in the region. 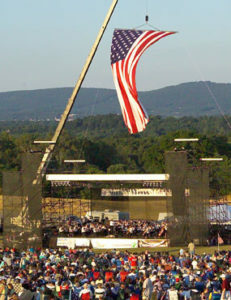 The “Salute” has been billed as “Maryland’s Most Patriotic Event” and “One of the top 100 Events in North America”. Absolutely a MUST-SEE! Held during the month of July in Shepherdstown, WV. Several plays which originated at the Festival (like Stickfly, Uncanny Valley, H20, The Insurgents, and Dead and Breathing) have been staged on or Off-Broadway. Farragut North–by Beau Willimon, the mastermind behind House of Cards–was produced by CATF in 2009 and later adapted for the silver screen as The Ides of March. Clearly a MUST-SEE! Held the second weekend in November – Shepherdstown & Jefferson County, WV. Start your Christmas Shopping during the annual Over the Mountain Studio Tour. Visit 10 different studios showcasing the works of 25 juried artisans. The show includes Stained Glass, Silver Art Jewelry, Blacksmithing, Woodcarving, Heirloom Baskets, Pottery, and Wooden Toys and more. Including live demonstrations, snacks, and wares for sale this tour is completely free! Unmistakably a MUST-SEE! Held late August in Hagerstown, MD. The annual Augustoberfest pays tribute to the area’s rich German heritage and supports scholarships for exchange students to Hagerstown’s Sister City—Wesel, Germany. This exciting event is run by the nonprofit organization, the Augustoberfest Charitable Foundation. Augustoberfest is a two-day festival that boasts festivities found at traditional Oktoberfest celebrations in Bavaria. The attendance of this event has doubled in size over the last few years and is becoming one of the most anticipated festivals in Washington County. Clearly a MUST-SEE! Held the second weekend of September in Boonsboro, MD. Sponsored by the Boonsboro Historical Society, Boonesborough Days is a festival devoted to showcasing handmade crafts by more then 150 venders. Browse through historic and picturesque Shafer Park and shop for traditional and Early American handmade crafts, paintings and unique gifts. Experience demonstrations of colonial candle making as well as age old skills of blacksmithing, chair caning, basket weaving, broom, soap and pottery making. The festival also features a Civil War display with artifacts, the Tri State Astronomers, horse-drawn wagon rides, great food and a classic and antique car show on Sunday. A really fun MUST-SEE! The Jefferson County Chamber of Commerce invites you to come and enjoy the Mountain Heritage Arts & Craft Festival in the rolling countryside of Jefferson County, WV. Leisurely stroll among the tents as you admire the many crafts, fine arts, and wine. Meet approximately 200 artisans and craftspersons carefully selected and prejudged, demonstrating and showcasing their work at this nationally acclaimed festival. Enjoy listening to the best live bluegrass music, taste wines from the area’s foremost wineries and enjoy the many varieties of food that are available. Clearly a MUST-SEE! Held the first Saturday of December at Antietam National Battlefield near Sharpsburg, MD. On the first Saturday of December for over 25 years volunteers spend the day placing luminaries along the park roads and the rolling hills of the Antietam National Battlefield. 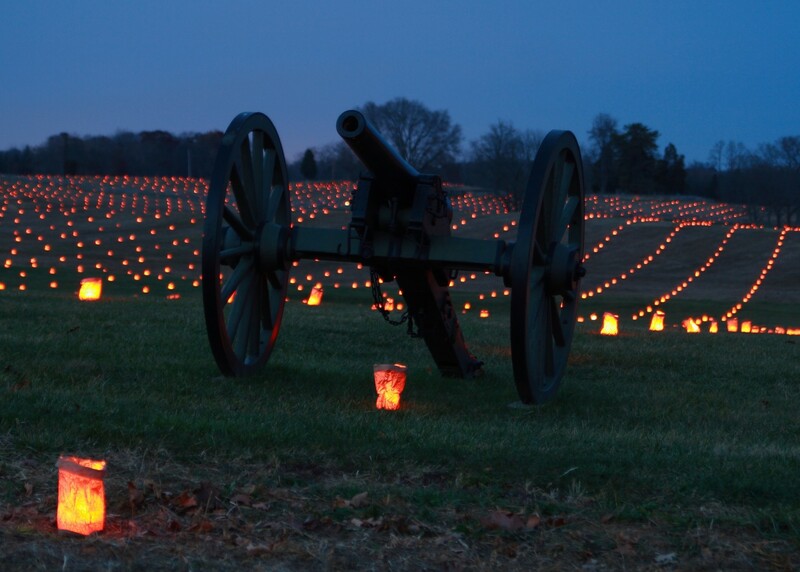 By twilight, 23,110 luminaries will be lit, one for each soldier who was killed, wounded or missing during the bloodiest day in the American Civil War. The free 5 mile driving tour is the largest memorial illumination in North America. The first Illumination was held in 1988. Antietam National Battlefield, in cooperation with the American Business Women’s Association and the Washington County Convention and Visitors’ Bureau, will host the Annual Antietam National Battlefield Memorial Illumination in honor of those soldiers who fell during the Battle of Antietam. A very touching MUST-SEE! Check your calendar and make your reservations now so that you can be sure to include one of these MUST-SEE events during you stay at the Inn!